According to the UN Department of Safety and SS Kenya report, 19 UN staff perished in the crash. 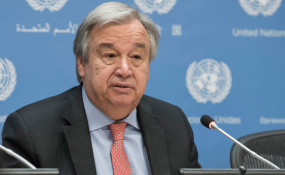 The World Food Programme (WFP) lost six staff, the Office of the High Commissioner on Human Rights (UNHCR) lost two, as did the International Telecommunications Union (ITU). The Food and Agriculture Organization (FAO), International Organization for Migration (IOM) in South Sudan, World Bank and UN Assistance Mission in Somalia (UNSOM) each lost one staff member. Six staff from the UN Office in Nairobi (UNON) were also tragically killed. Executive Director of the World Food Programme (WFP) David Beasley tweeted that "the WFP family mourns today", revealing that WFP staff were also among those on board the flight. "We will do all that is humanly possible to help the families at this painful time. Please keep them in your thoughts and prayers", he said. Houlin Zhao, SecretaryGeneral of ITU tweeted his "sincere condolences to the families and friends of those who lost their lives in the plane crash" Noting that two ITU staff were on the flight, he said: "Our colleagues in Addis are providing support to their families during this difficult time."